In January, the appointment for the entire confectionery, ice-cream, bakery, chocolate and coffee sector is with SIGEP. The ITALIAN EXHIBITION GROUP - IEG is ready to celebrate the 40th edition of the fair in the Rimini exhibition center. 40 years of meetings, shows, exhibitions and consolidated business relationships. SIGEP will be staged from 19th to 23rd January 2019 and for the occasion a pay off has been chosen that addresses the future, an increasingly international future: "40th FOR THE FUTURE". The first novelty is indeed the graphic restyling to celebrate this professional birthday. The pay-off combined with the logo that expresses positivity, if read vertically transmits maximum positivity, through the letters Yes, which may also appear to be Yes's Y. The concept is deliberately strong, to convey achievements and new international goals to be consolidated. The five vertical bars that we find in the graphics of the 40th identify the 5 pillars on which the whole event is based: Bakery, Pastry, Coffee, Chocolate and Ice-cream. On display it is possible to find the raw materials, the ingredients, the most used new technologies and the best solutions to apply them, the equipment, the furnishings and all the services for the industry and for the professionals who move this market. 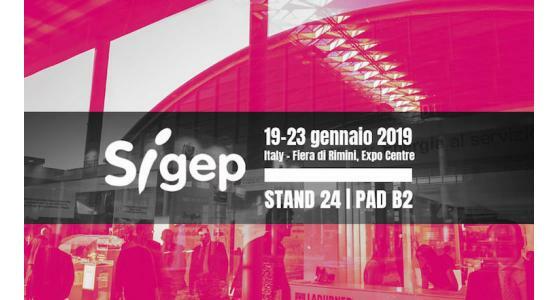 But what differentiates SIGEP more and more clearly is the busy calendar of events, of real shows, where chefs and professionals compete in explanations, live demonstrations and meetings with their target audience, to share and grow together. On the occasion of 40 years of the fair SIGEP has published, on the official website, a calendar that traces the timeline of each past edition to relive the entire route of the event, from the first debut until last year. For this new exhibition we start with important numbers, those of the last edition. In 2018 SIGEP gathered 1,250 exhibitors, with the presence of well-known big players in the sector worldwide. 167.948 visitors were registered. The show always covers the entire fair district with a total exposure of 129,000 square meters and occupying 28 pavilions. The energy that is breathed at SIGEP is always very festive, but in fact it is an event dedicated to the business, where the professionals of the supply chains can increase their skills and above all can evaluate new markets and new synergies for the economic development of the activities. There is no shortage of competitions and prizes for the best innovative products, recipes that mix new tastes, natural elements and original flavors. The look that SIGEP wants to give this year is aimed at the future, intended as consolidation and as a global expansion, both of the position that this fair has achieved over time in the world, and for the companies that participate with the intention of expanding their markets with new international outlets.